Roger Stone Claims Mueller Will Indict Junior, Denies Coming Report He Tipped Off Trump On Hillary's Emails - Joe.My.God. Longtime Trump ally Roger Stone on Monday preemptively pushed back on reports alleging he tipped the President off about WikiLeaks’ pre-election releases of emails stolen from Hillary Clinton’s campaign. In a video posted to Instagram, Stone vehemently denied the assertion, which he claimed several news outlets are pursuing. 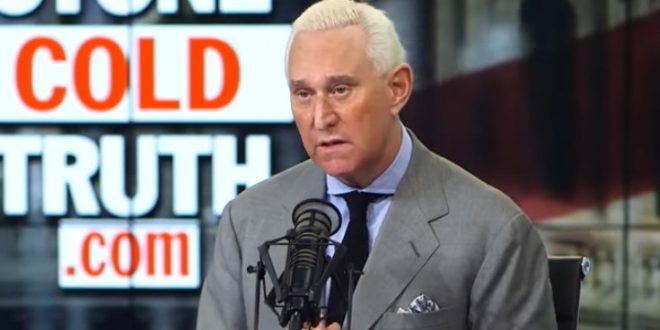 “Somebody has been pushing a fake news story, first with the New York Times, then the Washington Post and now with Ronan Farrow of the New Yorker,” Stone says in the video. “The special counsel is going to charge Donald Trump Jr. with lying to the FBI. Notice they’re not charging him for having an illegal meeting with a Russian at Trump Tower because there’s nothing illegal about that meeting,” Stone told James Miller of The Political Insider.